Height is measured excl. straps. The 50s Rosie Quilted bag vintage style patent Raven Black from Collectif is a perfect vintage inspired small firm square handbag. It is inspired by the worldfamous vintage 2.55 bag with its quilted stiches. 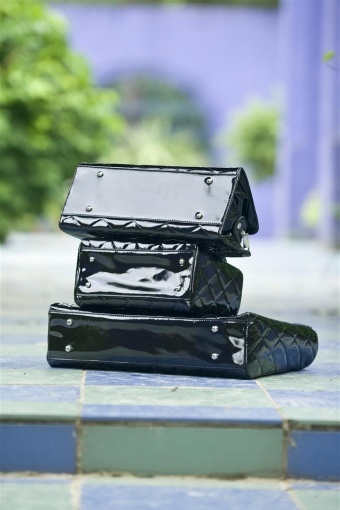 Made of glossy black faux leather. Silver zipper and silver metal detailing. Silver metal feet. Interior rockabella black fabric satin with white roses and small zipper pocket. Kim is wearing the Dolores dress in Teal.